Friedrich von Knaus(s) (1724-1789), was a German watchmaker, mechanician and inventor, who built clockwork mechanisms which could, in a simple way, play musical instruments, write short phrases, or conduct other individual, specialized tasks. It is believed, that namely Knaus created the first writing automaton. 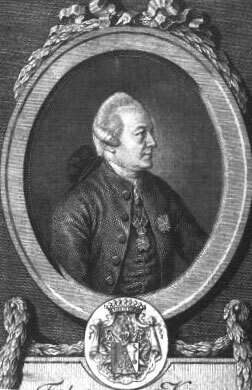 Friedrich von Knaus was born on 7 February, 1724, in Aldingen near Ludwigsburg, now a suburb of Stuttgart, in the family of Johann Ludwig Knaus (1689–1742) and Anna Margarethe Knaus (1689–1756). Johann Ludwig Knaus was a schoolmaster and later a court mechanic and clockmaker in the court in Darmstadt. Friedrich had an older brother, Johann Philip Ludwig (born 1715), who also became a prominent watchmaker and worked together with Friedrich on several automata. Showing his capabilities at an early age, working in the workshop of his brother, Friedrich was engaged with the Darmstadt great duke's court as Kammerdiener and Hofmechanicus. Then he was taken to the service of the Prince-voter Clément Auguste of Cologne. Later Knaus went to Paris, where in 1753 presented his first writing automata to the French King Louis XV, but without success. So he moved in Holland and Belgium, where he came on duty of the Prince Charles of Lorraine in Bruxelles, and then in 1756 he came to Vienna, where in 1757 he established the Physikalisches Hofkabinett ("Court Cabinet of Physics"), of which he was appointed President. In 1757, Knaus completed work on a mechanical musician that played the flageolet, a kind of recorder. Some of his most famous constructs were four mechanical speaking heads in 1770; however, they were not very successful. Among his other inventions are a writing desk for the Emperor with a copy machine and "movable picture panels". In 1778, Knaus was requested as a Hauptman to the artillery of Vienna, where he died on August 14, 1789. Knaus made several (at least five) writing automata of which the first was presented in France in 1753. In his earlier examples the writing was merely traced by a hand holding a pen. The fourth writing automaton however had significant improvements, as it was a true writer (a figure) able to write lengthy text. Knaus presented it in 1760 to the Holy Roman Emperor Francis Stephen. The automata, shown in the nearby figure, was made by Knaus in 1764 and was donated to his patron Prince Charles of Lorraine. The clockwork mechanism moves a hand, causing it to dip the pen in the inkstand and write the words "Huic Domui Deus / Nec metas rerum / Nec tempora ponat" (May God not impose ends or deadlines on this house) on a small card. The mechanism's (made by silvered copper with dimensions 68 cm width, 100 cm height) silvered metal coating carries the words "Pro patria." 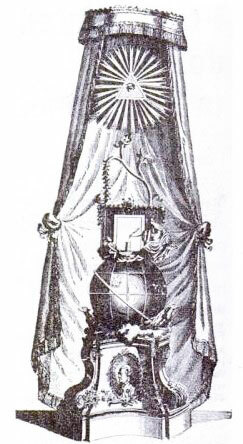 None of the mechanisms of Knaus' most advanced writing automata (see the figures below) was contained in the body of the figure, but enclosed in a metal sphere on which the figure was placed. The principal mechanism constitutes a horizontal roll composed of pins, introduced into appropriate openings. When moving, the pins press on a keyboard containing keys, each key corresponding to a letter. The machine wrote a lengthy passage of 107 words and antedated the similar machine of Jacquet-Droz by almost two decades. 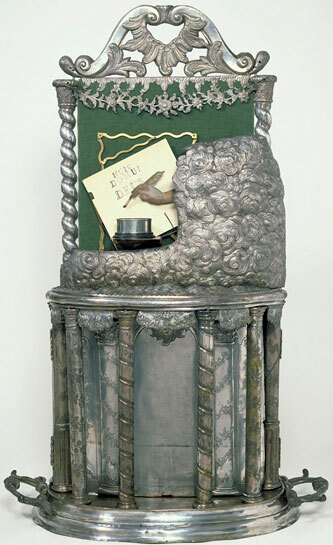 While the first three machines produced a programmed text, the fourth, preserved to the present day in Vienna (Wien, Technisches Museum), could write any phrase composed in advance, and it could also write to dictation by means of a hand-operated control on the letter keyboard. After having drawn some characters, the Writer automatically dips his feather in the inkpot in front of him. A special mechanism located behind moves the shelf towards the left after each letter; when a line is finished, the shelf is push at the same time in the horizontal and vertical direction. Dear Sir, do me the honour of listening to me and to what I am writing for you. The world thought that I would never be perfected by my maker, he was even so persecuted, that it was possible: but now, he put me into such a state that I write all languages, despite all his envious people, and I am truly, Dear Lord, the most loyal secretary. Von Knaus' masterpiece was an imposing piece set on a 3 inch high wood pedestal. It measures 1.9 metres from the ground to the writer's head. 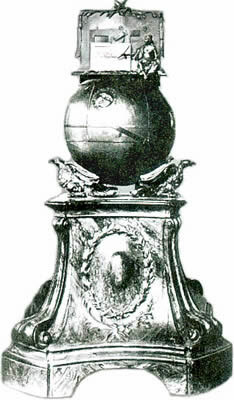 There is a large metal sphere about 80 cm across, with six opening sectors, which contains the mechanism for writing and is supported by two bronze eagles. The mechanism is of cast iron. Originally, it was gold-coloured and the meridian circles were showed by meshes of silver. Over the sphere, on a platform imitating a cloud, on the right side, is sat a goddess, from who a little genius is getting inspired. In the centre, a little shelf is erecting a vertical little table, which supports the sheet of paper on which the automaton, with its quite long arm, writes the characters previously printed on a cylinder. At each end of line, the goddess puts up her hand and the sheet of paper moves, thus ensuring to start again a new line. The entire sheet of paper is covered in fifteen minutes. After having written several characters, the writer automatically dips its quill into the ink pot which is in front of him. A special mechanism situated at the rear side moves the little table to the left after each letter. When a line is finished, the little table is pushed both to the horizontal and vertical directions. If the cylinder is taken out of the mechanism, the operator can manually operate the levers register, thus "dictating" to the writer what we want him to write.